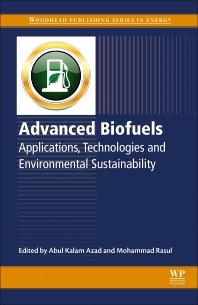 Advanced Biofuels: Applications, Technologies, and Environmental Sustainability presents recent developments and applications of biofuels in the field of internal combustion engines, with a primary focus on the recent approaches of biodiesel applications, low emission alternative fuels, and environmental sustainability. Editors Dr. Azad and Dr. Rasul, along with their team of expert contributors, combine a collection of extensive experimental investigations on engine performance and emissions and combustion phenomena using different types of oxygenated fuel with in-depth research on fuel applications, an analysis of available technologies and resources, energy efficiency improvement methods, and applications of oxygenated fuel for the sustainable environment. Academics, researchers, engineers and technologists will develop a greater understanding of the relevant concepts and solutions to the global issues related to achieving alternative energy application for future energy security, as well as environmental sustainability in medium and large-scale industries. Azad’s research focuses on advanced biofuel production and combustion, energy extraction and processing, advanced computational fluid dynamics (CFD) modelling and analysis, renewable energy (bioenergy, wind energy etc. ), and natural gas processing and oil refinery. Professor Rasul specializes in clean and sustainable energy technologies and their applications in industries. His research mainly focuses on renewable energy (solar, wind, biomass and biofuels), building energy (domestic, institutional and commercial buildings), industrial energy (process and resource industries), and thermo-chemical conversion of energy (combustion, gasification and pyrolysis).